Nearly no sewing was done and now I have 6 quilts to finish in the next 6 weeks, for my Guild show, for their charity drive, for the gallery and two for the boys. Thankfully the cooler air is on its way back. 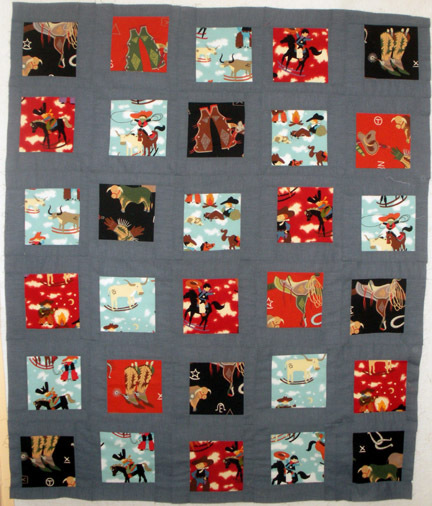 I did finish the cowboy quilt top for the small boy. (Still haven’t figured out the fish-eye thing that distorts all my pictures, grr.) I sashed the prints in a denim colored Kaffe shot cotton. I’m not a huge fan of this shot cotton, it’s very thin and stretchy, but the dungaree look was exactly what I was going for. Nearly no cooking and very little bread baking, save simple grilling (which is often the best choice in summer anyway). Last week I made some Potato Bread with leftover mashed potatoes and yesterday I did try a standout dish from the Smitten Kitchen, Blue Cheese and Red Potato Tart. So good!! So lastly, dear readers (if there are any of you left after my hiatus) is that I’m folding up this blog after over 3 years and will now post only to our Sew Fresh Blog. I need to whittle down my to-do list and one blog is plenty. I hope you join me there for more fabric, food and fancy! Just back from vacation, 10 days RV camping with my in-laws. It was a great time. The small boy wants to live there forever. What’s not to like? A swimming pool, a playground, dirt roads for bike riding, (almost) never wearing shoes, a few amusement park trips and last, but not least, S’mores! The cry coming home was ‘I want to roast marshmallows’. It’s pronounced ‘mosh-meh-woes’ by the newly crowned 4-year old. 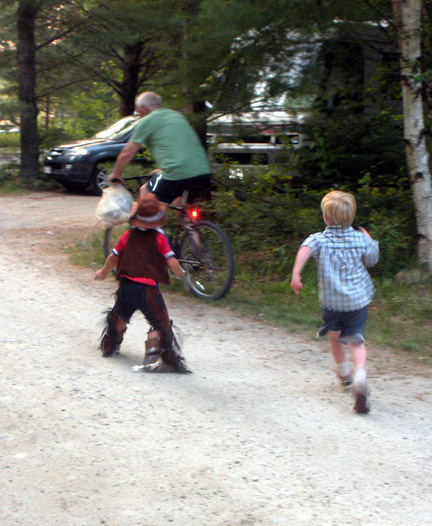 This action shot is of the birthday boy in his new cowboy outfit (over the Red Sox attire that he refused to change), chasing Poppa with one of the cousins. Pedal, Poppa, pedal! In the blur before we left, I was able to finish a baby quilt for my dear friend’s little boy. It has lots of Amy Schimler’s Forest Friends with some surprising coordinates like Joel Dewberry’s chestnuts and Michael Miller’s hedgehogs. The big boy was helping with the photo shoot. By the second photo, the small boy had to help and add his bare feet to the shot. Thanks Bubba. 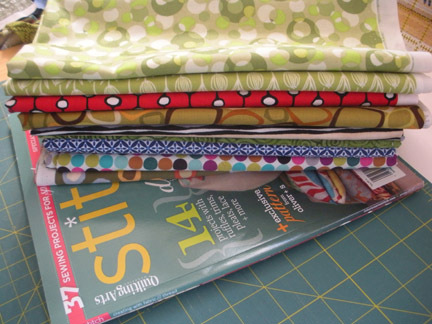 Is it wrong to have so much fabric that you can, on any given Sunday, find a dozen coordinating fabrics, cut off a couple of strips of each, then cut and sew 54 blocks for a lap quilt? Is that too much fabric or just enough? Even though I didn’t even make a dent in my stash and out popped a quilt top, I’m going with just enough. How bad would it be to get half way through only to not have what you need to complete a project. You’re with me, right? Those of you who read this blog know that I’m not a fan of pastel baby quilts. I’m pretty much against them, in fact. This is for a new baby boy. 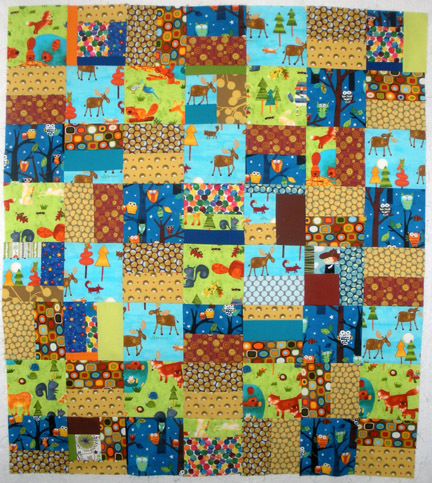 The forest critter fabric is from Amy Schimler and it pairs nicely with some Michael Miller hedgehogs, Joel Dewberry chestnuts and a couple of Eric Carle dots and odd scraps thrown in for good measure. Super simple blocks but not bad for any given Sunday afternoon. Ever get the feeling you just have to sew something? Something quick and easy, an instant gratification fix. This fun pillow cover is it. I finished in just under an hour. I cut strips of the fantastic bikes from Erin McMorris’ new line, Weekends (a good choice for the long holiday weekend!) 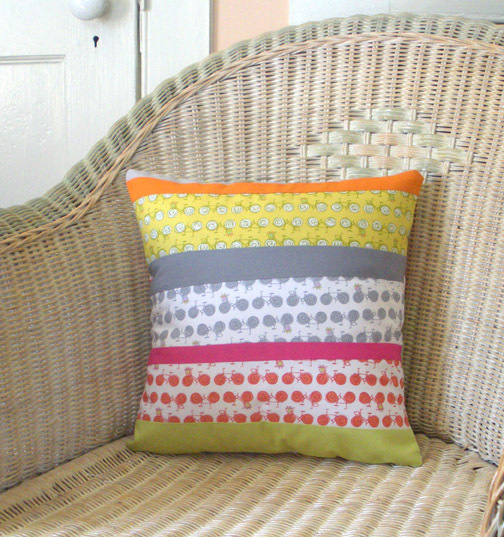 and paired them with strips of Kona solids – cactus, bright pink, medium grey, orange and ash. I didn’t even care if I sewed them that straight. A little wonky never hurt anybody. It’s a simple envelope enclosure in the back. If anyone is interested in a tutorial, leave a comment and I’ll get a more specific write-up for you. All fabrics used are available in our shop. 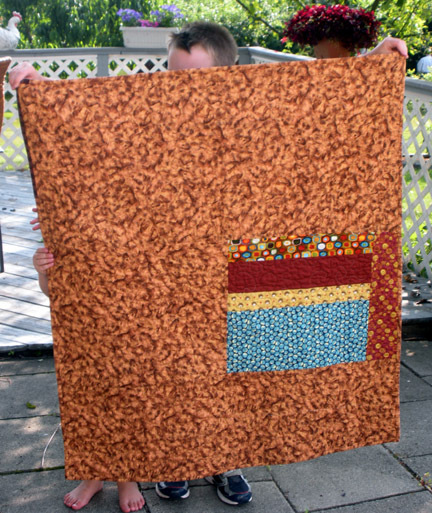 This quilt features Laura Gunn’s Lantern Bloom fabrics and warm, rich Kona solids. I first fell in love with the Lantern Bloom line because of the jewel tone colors, painterly quality and wonderful design. I chose four fabrics and wanted to find a way to highlight both the large scale designs as well as the small organic prints. Solids seemed like a great choice to show off both. I chose three warm browns in Kona solids – coffee, brown and cinnamon – for most of the blocks but added some pop with thin strips of berry and cyan. After the main blocks were done, everything else followed the same improvisational path. In other words, how much of each fabric did I have left to make borders and a back. I think I pieced almost every bit of these fabrics, wonky as all get out, before all was said and done. 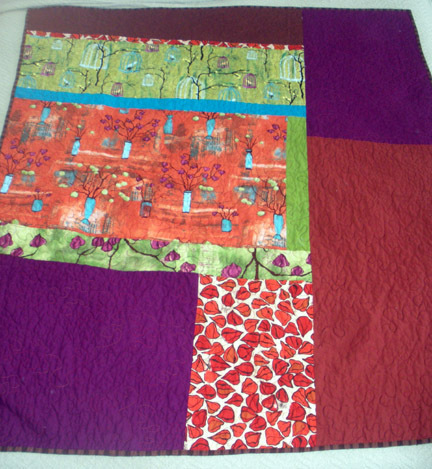 The quilting was stippled with a variegated thread that ran from eggplant to rust (a happy find in my thread bin from an earlier project). Thanks for visiting my blog and enjoy the rest of the festival! 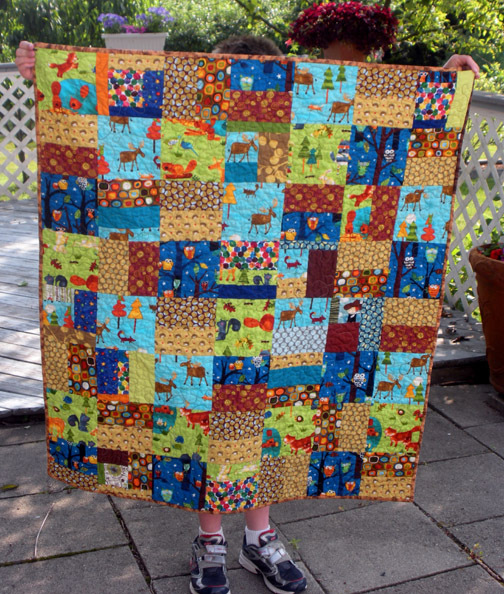 Be sure to check out my Sew Fresh business partners’ house quilts for her daughter, they’re drop dead gorgeous! A kooky assortment of fabric purchased along with the Stitch magazine featuring the Project Improv quilt tops. 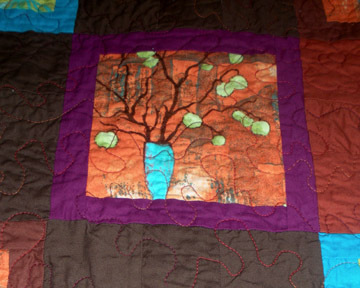 One of my blocks is right there in the blue and green quilt top! 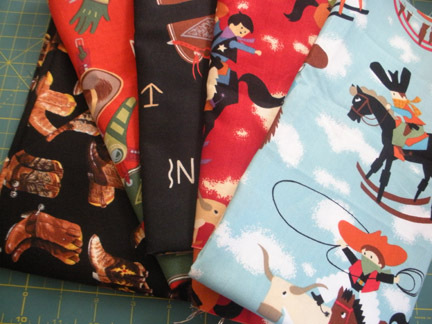 A new project to start for my rodeo obsessed little boy (after the nearly complete quilts I worked on over the weekend get their bindings sewn). And lastly, though most importantly, a quilting lesson was learned. It goes a little something like this. Your top thread keeps fraying and breaking. After rethreading umpteen times, changing thread spools, changing needles, winding new bobbins, changing bobbins, cursing more than a little …. take a look under the metal throat plate of your machine. It is possible that there lies, unseen, a maniacal dust bunny of gargantuan proportions that is the root of this evil. 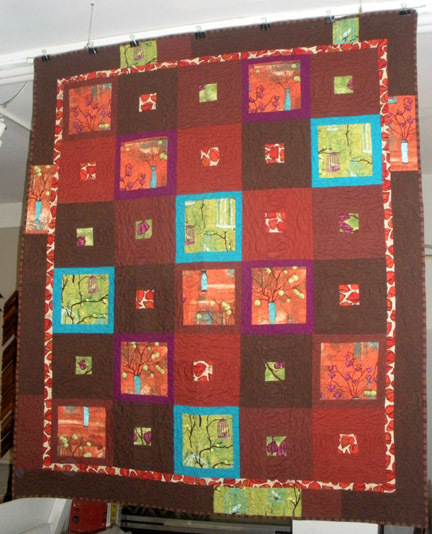 The exorcism is simple and alas, quilting goodness is restored. Sigh, if only I had suspected earlier, I wouldn’t have a hundred top threads to sink on a lap sized quilt. Grrr. Had to Pass it on. Dirty Little Truths about Sewing.